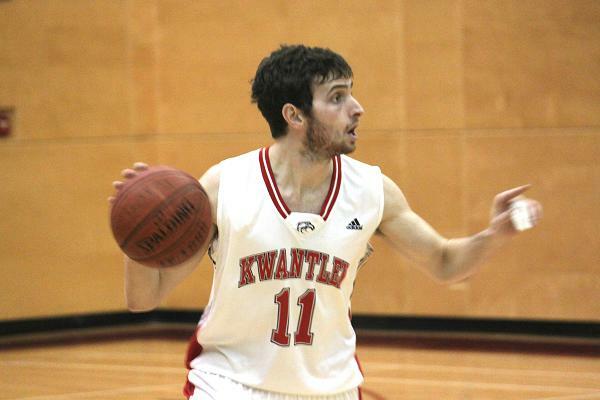 Friday night, the Kwantlen Eagles won some and lost some against the Langara Falcons on home court in men’s and women’s basketball. 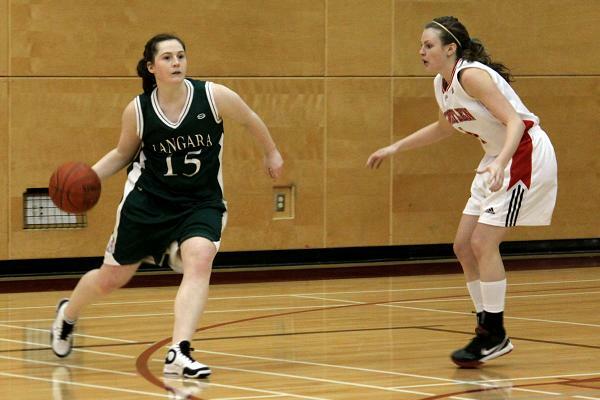 The women’s team had a heartbreaking, down-to-the-last-second loss against Langara with a final score of 68-66. 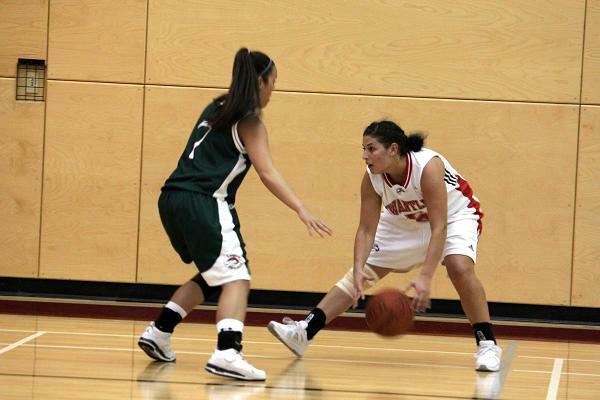 A questionable pushing foul on Taminder Dhaliwal in the fourth quarter allowed the Falcons to sink two free throws with seven seconds left on the clock. The score was close for most of the game with the women’s team just behind 27-26 at the end of the second quarter. Shortly after, Jessica Williams closed the gap, tying the game 33. Other highlights included a breakaway layup by Dhaliwal in the third and a layup through a crowded court by Grace Pawluk. 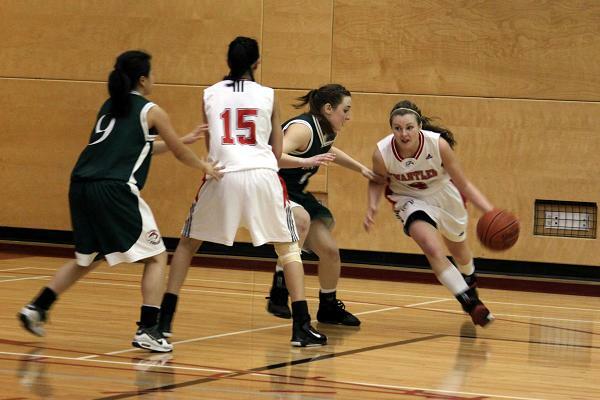 The women’s team league record sits at seven wins, nine losses. 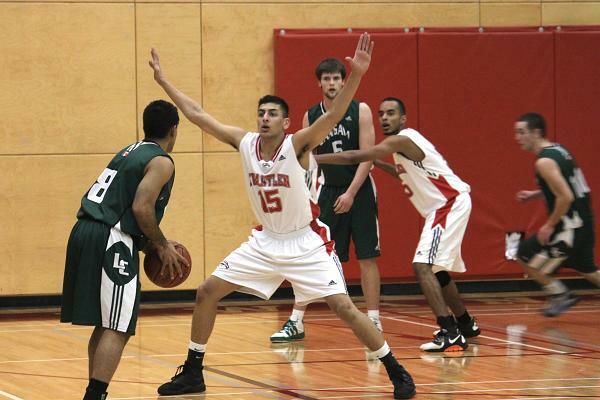 Meanwhile, the men’s team picked up its third straight win, beating Langara 80-66. The Eagles closed in on a 20-point lead in the third quarter with four consecutive baskets, two of which were three-point shots, making the score 56-36. 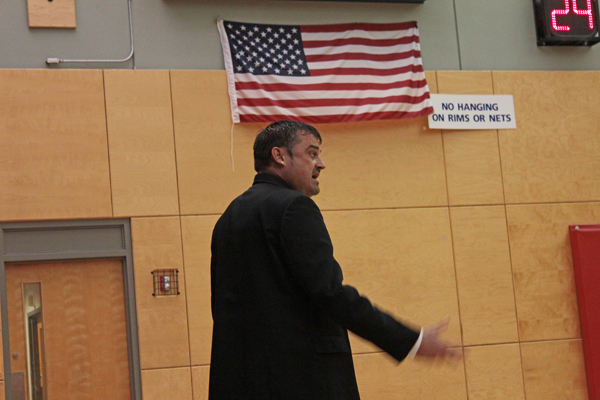 The Falcons tried to catch up, but Kwantlen maintained a steady lead through the fourth. 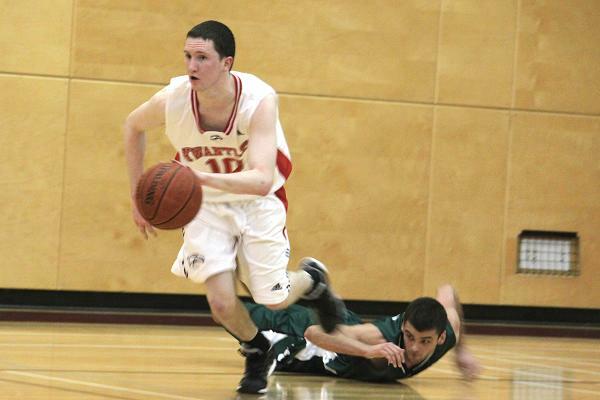 Highlights included a series of baskets by Doug Meyers and a collision between Mike Davis and Langara’s Yassine Ghomari. Davis limped off the court in the remaining seconds of the second quarter, but returned to the court in the third. 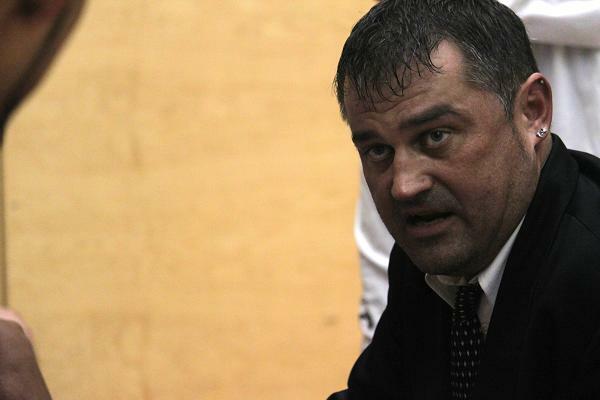 The men’s record is now six wins, 10 losses. Williams keeps up the defense against Jena Riches around the three-point line. 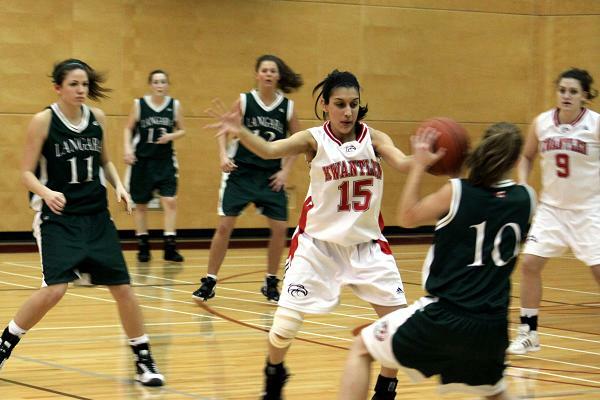 Taminder Dhaliwal tries to block Paige Burnham from passing to her teammates. 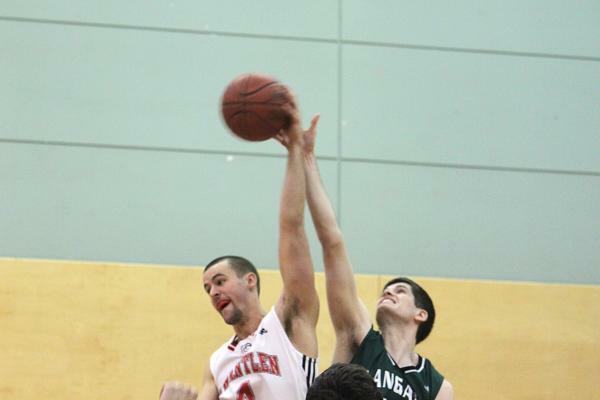 Kevin Kokoska wins the tip-off, getting the basketball away from Karol Cybula. 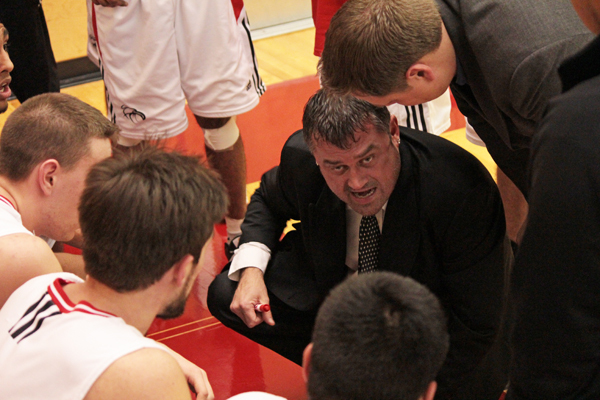 Mike Davis directs his teammates around the Falcons’ basket in the second quarter. Varinder Singh attempts to keep Hardeep Braich from shooting or passing. 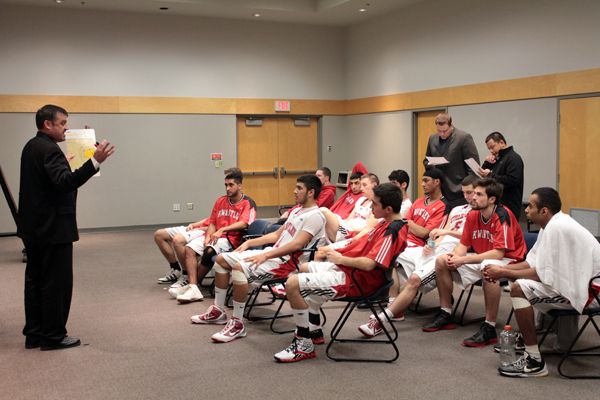 Bernie Love, the Kwantlen Eagle’s Head Coach for the men’s team, provides motivation as the fourth quarter winds down.